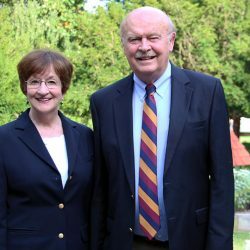 Penn State Berks Chancellor R. Keith Hillkirk and his wife, Suzanne, have recently created a new endowment, the Hillkirk Family Program Endowment for Ethics and Sustainability. The name reflects the passion that the Hillkirks have for these two priorities, which are emphasized in the college’s strategic plan. This endowment, which was funded with an initial gift of $25,000, will provide ongoing support to increase awareness and education and to encourage action in the campus community and beyond, regarding issues related to ethics and sustainability. This new fund will provide resources for programs and initiatives that will enrich the campus community in creative and meaningful ways. The college has established a committee that will review funding requests, which can be initiated by faculty, staff, and students. Hillkirk has been chancellor of Penn State Berks since 2011. Prior to coming to the college, he served as chancellor of Penn State Schuylkill. He served for seven years as dean of the College of Education and Human Services at Southern Illinois University Carbondale and nine years as a faculty member, director of partnerships, and assistant dean for teacher education in the College of Education at Ohio University. A Pennsylvania native, Hillkirk was an assistant professor of education at Penn State’s University Park campus after earning his doctorate in Curriculum and Instruction. His scholarly interests include models of professional development and the creation and maintenance of partnerships among universities, schools and communities. Suzanne Hillkirk is a graduate of Miami University. She earned a master’s degree in Early Childhood Education from Penn State and worked as a kindergarten educator and early childhood program administrator for many years prior to her retirement. The Hillkirk Family Program Endowment for Ethics and Sustainability will help Penn State Berks reach its goal for A Greater Penn State for 21st Century Excellence, a fast-paced campaign focused on the three key imperatives of a public university. Private support will keep the door to higher education open and enable students to graduate on time and on track to success; create transformative experiences on Penn State campuses and around the globe that tap the full potential of Penn Staters to make a difference; and impact the world through discovery, innovation, and entrepreneurship.